This is the first in a series of blog posts in which I want to introduce you to Neo4j‘s user defined procedures and the APOC procedure library in particular. Besides many other cool things, of the best features of our recent Neo4j 3.0 release were callable procedures. There are a number of built-in procedures, that currently provide database management and introspection functionalities. Going forward, more functionality will be provided through these procedures (e.g., user management and security, transaction management and more). Essentially they are a way to extend the given query language, in our case Cypher, with custom functionality that adds new capabilities. You can call procedures stand-alone as a singular statements, or as part of your more complex Cypher statement. Procedures can be called with parameters, and their return values are a stream of columns of data. If you call a procedure as part of a Cypher statement you can pass in not only literal parameter values (strings, numbers, maps, lists, etc. ), but also nodes, relationships and paths. This enables a procedure to execute graph operations from simple neighborhood expansions to complex iterative algorithms. For the result columns that are returned by a procedure, you have to use the YIELD keyword to select which of those are introduced and potentially aliased into the query. Procedures can be small, generic helper functions for common tasks, but also very specific solutions and additions to your specific use case. You need that last little bit of performance for a graph algorithm or operation where you can’t afford any indirection between your code and the database core. Only then should you consider writing a user-defined procedure. Writing a user-defined procedure is pretty straightforward in most programming languages on the JVM. You just need to create an method annotated with @Procedure that takes in any of the Cypher types as named parameters and returns a stream of data transfer objects (DTOs) each of whose fields becomes a column in the procedure output. One very simple procedure that I also used before to explain this feature is providing the capability to generate UUIDs. As you probably know, that’s something very easy to do in Java, but not so much in Cypher, and still sometimes you want to add uniquely identifying IDs to your nodes. In our example, we will provide the uuid procedure with a number which indicates how many UUIDS we’re interested in. Note that the only numeric types supported by Cypher are long and double which encompass their smaller size brethren. For our results, we use a dedicated Java DTO, that contains our two result columns as public final fields. As a fun side-effect of using Neo4j procedures, you also get to play with Java 8 streams, but please don’t overdo it. We then use our favorite build tool (gradle, maven, sbt, etc.) to package our procedure as a jar and put it into the $NEO4J_HOME/plugins directory. Please make sure that all dependencies also become part of that jar, otherwise they won’t be found when your procedure is loaded. And mark the Neo4j dependencies (and other libraries that are already within the Neo4j distribution) as provided so that they are not packaged with and blow up the size your procedure jar. After restarting your server, your procedure should be listed when you CALL dbms.procedures(). If not please check $NEO4J_HOME/logs/debug.log. Now we can call our newly minted procedure to create nodes with UUIDs. We provide detailed documentation on how to do it in our Developer’s Manual and in an example project on GitHub that is ready for you to fork and adapt. While Neo4j 3.0 was maturing, I pondered about all the questions and feature requests I’ve gotten over the years regarding certain functionality in Cypher, and I felt that it was a good idea to create a generally usable library of procedures that covered these aspects and more. Drawing from the unlucky technician in The Matrix movie and the historic Neo4j acronym “A Package Of Components,” the name APOC was an obvious choice, which also stands for “Awesome Procedures On Cypher”. So the hardest part of all the work was done. In this blog series, I want to focus on each of these above-mentioned areas with a specific blog post, but today I just want to mention a few of the procedures to excite you about what’s to come. Just download the APOC jar file from the latest release on GitHub and put it into $NEO4J_HOME/plugins directory. After restarting your Neo4j server, a lot of new procedures should be listed in CALL dbms.procedures(). You can also CALL apoc.help("apoc") or CALL apoc.help("apoc.algo") for the help function built into the library. If you want to use any of the database integrations (e.g., for relational databases, Cassandra or MongoDB), make sure to add the relevant jar files for the drivers for those databases too. It’s probably easiest to clone the repository and run mvn dependency:copy-dependencies to find the relevant jars in the target/dependency folder. Many of the APOC procedures just return a single value which is of the expected return type and can be aliased. Some of them act like Boolean filters, i.e., if a certain condition does not match (e.g., isType or contains) they just return no row, otherwise they return a single row of “nothing”, so no YIELD is needed. As there are no named procedure parameters yet, some APOC procedures take a configuration map which can be used to control the behavior of the procedure. One very handy feature are the metadata capabilities of APOC. Being a schema-free database, you probably wondered in the past, what the underlying graph structure looks like. The apoc.meta. 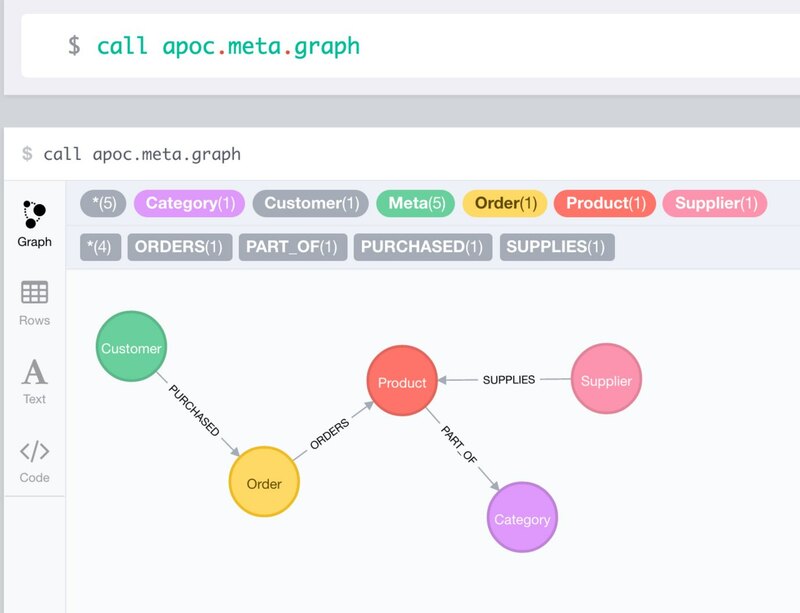 * package offers procedures that analyze the actual content or database statistics of your graph and return a meta graph representation. The simplest procedure, apoc.meta.graph, just iterates over the graph and records relationship-types between node labels as it goes along. Other more advanced procedures either sample the graph or use the database statistics to do their job. The visual metadata procedures return virtual nodes and relationships which don’t exist in the graph but are returned correctly to the Neo4j Browser and client, and are rendered just like normal graph nodes and relationships. Those virtual graph entities can also be used by you to represent an aggregated projection of the original graph data. Loading data from web and other APIs has been been a favorite past time of mine. With apoc.load.json, it’s now very easy to load JSON data from any file or URL. If the result is a JSON object, it is returned as a singular map. Otherwise, if it is an array, it is turned into a stream of maps. Let’s take the Stack Overflow example linked above. Now it can be used from within Cypher directly, let’s first introspect the data that is returned. 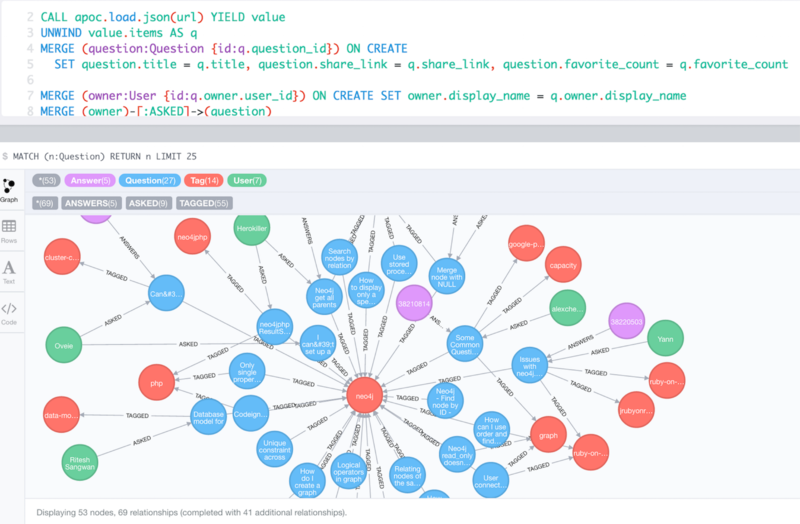 Combined with the Cypher query from the other blog post, it’s easy to create the full Neo4j graph of those entities. The documentation also contains other examples, like loading from Twitter and Geocoding. While Cypher sports more collection and data structure operations that most other query languages, there is always that one thing you couldn’t do yet. Until now. With procedures it is easy to provide solutions for these missing pieces, oftentimes just a one-liner in the procedure. That’s why APOC contains a lot of these utility functions for creating, manipulating, converting and operating on data. Creatings pairs of a list of nodes or relationships can be used to compare them pair-wise, without a double loop around over an index value. Currently you can’t create a map from raw data in Cypher, only literal maps are supported and the properties() function on nodes and relationships. That’s why APOC has a number of convenience functions to create and modify maps based on data from any source. Converting between numeric time information and its string counterparts can be cumbersome. 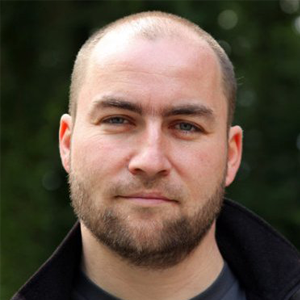 Exporting your database with the dump command that’s built into neo4j-shell generates a single large CREATE statement and has a hard time dealing with large databases. The procedure first writes commands to create constraints and indexes. Nodes and relationships are created in singular Cypher statements, batched in transactional blocks. For node lookup, it uses constrained properties on a label (kind of a primary key) if they exist. Otherwise it adds a temporary, artificial label and property (the node-id) which are cleaned up at the end. Even the journalists of the ICIJ used APOC as part of the browser guide they created for the downloadable Panama Papers Neo4j database. Really cool! The next blog post in this series will cover data integration with APOC. Please try out the procedures library, you can find it here on GitHub, and might find its documentation (WIP) helpful. If you have any feedback or issues, please report them as GitHub issues. I want to thank all the contributors that provided feedback, code and fixes to the library. Want to take your Neo4j skills up a notch? Take our (newly revamped!) online training class, Neo4j in Production, and learn how scale the world’s leading graph database to unprecedented levels. Now that was a find! I don’t frequently comment on blogs, but when I do — it’s because it was an awesome entry! I’m super excited to start using APOC. BTW — can you point me to some more documentation options? CALL apoc.help(“apoc.algo”) isn’t as verbose as I’d like. Thanks. I’ve passed the kind comments onto michael.